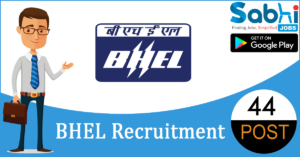 BHEL recruitment 2018-19 notification has been released on official website www.bhel.com for the recruitment of 44 vacancies at Bharat Heavy Electricals Limited. The candidate who is looking for Diploma Apprentice can apply offline application on or before 24th July 2018. Qualification Diploma Apprentice (DE): Candidate must have Civil, CSE, EEE/ ECE, Machanical passed the qualification examination in the year 2016, 2017 & 2018. Diploma Apprentice (DCCP): Diploma in Computer Commercial Practice.